Last year Saido Berahino burst onto to the Premier League scene with a winning goal at Old Trafford. At that point it looked like the Baggies had an unearthed a genuine prospect. A new contract was quickly agreed to keep him at West Brom for the next few years. He made 32 appearances in total but his form was at best fitful and his star was definitely on the decline on the back of some unwelcome tabloid reports that suggested that he was fonder of partying than training. By the close of last season Berahino's career at the Hawthorns seemed to be sinking into the morass that was Albion's Annus horribilis. From bright young thing to infant terrible in the space of six months, most Albion fans were losing patience with him and few would have suggested building the team around him. The 2013/2014 season was one to forget for West Brom and change was needed. During the closed season Alan Irvine was appointed into the Hawthorns hot seat. This might have been the first piece of good fortune that Saido enjoyed because Irvine has a reputation for nurturing young talent from his Everton days. Equally a new Head Coach meant a clean slate and an opportunity to move on from his previous mistakes. The second piece of good fortune was that Albion's record signing Brown Ideye spent much of the pre-season kicking his heals in Nigeria because his visa application was delayed by mind numbing red tape and religious holidays. 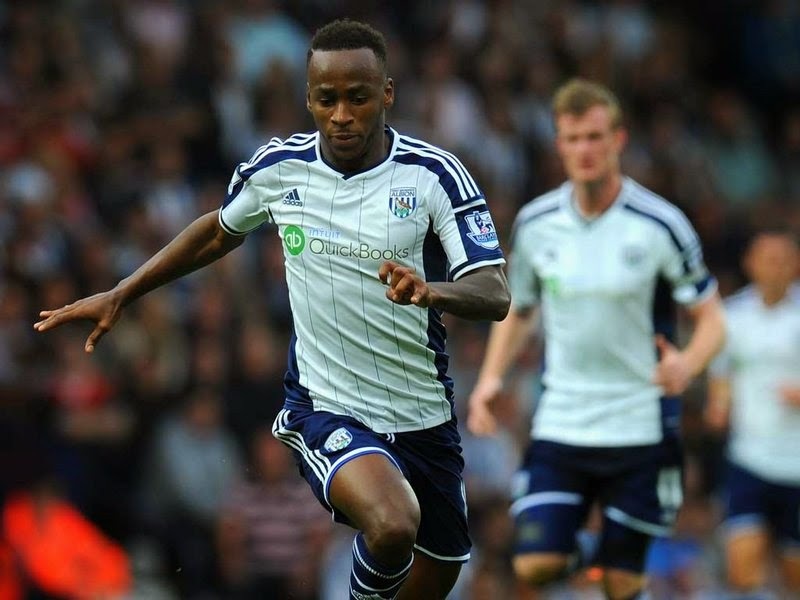 His delayed arrival gave Berahino a chance to stake a claim for a starting place. It is fair to say that after grabbing 2 goals on the opening day Saido has gone from strength to strength. He currently has 7 goals from 9 games and has been one of the leading lights of the England under 21 set up. He is rapidly developing into the one of the best young players in the league and as such he is one again being thrust into the limelight. At this moment his coaches and teams mates have nothing but praise for him he seems to be enjoying life under Irvine and working diligently on his game. The difference between this year and last is quite marked. It is notable that he looks physically stronger, at a slender 5ft 10 Saido is not the biggest centre forward and he will always be competing against larger Centre Backs but it is vital that he can hold up the ball up under physical pressure which is starting to happen. Secondly his decision making and awareness is improving. Finally he has always had an eye for goal but there seems to be more composure in front of goal and this was demonstrated most clearly against Man United when he had one chance and took it with great aplomb, when he was through on goal I would have bet my house on him hitting the target something I wouldn't have done last season. In Berahino's case the penny seems to have dropped, either he has worked it out for himself or he has at least listened to someone who has told him a party lifestyle and the life of a professional athlete are incompatible on any number of levels. Firstly there is the physical aspects of partying into the wee small hours and secondly there is negative PR, neither is good for a player. It would be unreasonable to expect a young man to live the life of Trappist monk but equally when you are making headlines for your lifestyle rather than your performances on the pitch it is time to take stock. If Saido ignores the party siren he also needs to ignore the lure of the big move siren. Given his current form speculation is rife about a move to more glamorous surroundings. As an Albion fan I want two things to happen firstly I want Saido to live up to his undoubted potential develop into a 15 plus goals a season forward and secondly I want him to retire from the game as in his mid 30's with every major honour and still be a Baggie. The first is possible but the second is unlikely. It is the nature of the modern game that once a player shines at a relatively modest club the vultures start to circle. From the player's view he only has one career and if he wants to scale the summits of Champions League football that is not going to happen at West Brom. The latest rumour is of interest is from Liverpool who are rumoured to be on the verge of offering £25m to lure him away which is £10m more than Spurs were apparently to be prepared to pay a month ago which demonstrates how fevered the speculation is that surrounds the game in general. The story will run forever on the basis of big club struggling for goals Berahino seems to be scoring for fun answer buy Berahino. Eventually it will come to pass but now is too soon for both player and club. It is almost unreasonable to hope that Saido will score goals at his current rate and a down swing in his form is almost inevitable. It is then that we will find out if his apparent new found maturity is for real, it is easy to do the right thing when things are going well but it takes inner resolve to carry on when things are going less well. If he comes through that then we have to say he is the genuine article. A new contract is in the pipeline and hopefully this will not go to his head in quite the same way as his first big contract did but from the club's perspective a long contract is vital to secure a top price should the almost inevitable move happen, but it is also pushes it down the the road for at least twelve months and quells the constant press speculation which is good for both club and player. With regard to England he is going to play a key role in the under 21 Championship and given the choices that the England manager has he is probably only a couple of injuries from a call up to the full squad, but he is still behind Rooney Wellbeck and Sturridge. He needs two good seasons but by the time the 2016 Euro's come around he might force himself into the reckoning. Club and player need each other in equal measure at this point in time. Saido is making a contribution in the here and now but the brighter his star burns the better for the club in the future. He is the poster boy for the club's academy which has struggled to hold onto talented youngsters but from now on we can point to Saido and genuinely say "stay with us if you are good enough you will get your chance" and that is a watershed moment for the club which has struggled to re-establish a tradition of youth development which once produced the core of each generation of Albion players. I do not want to get carried away by a few good performances but I am hopeful that in Saido Berahino we have found a home grown talent that we can be proud of. This week Saido was called up to the England senior squad, which was not entirely surprising given his form and Sturridge's continued absence. It might be a little too early for him but with limited options available to Roy Hodgson it was almost inevitable that he would turn to Berahino. From a playing perspective given the quality of the opposition in Scotland and Slovakia Saido should be able to make the step up. However the level of attention surrounding England and the media circus is something that Saido has yet to encounter and something that many players who have been bought up at far higher profile clubs than West Brom have sometimes struggled to adjust to. Almost as soon as the call up was announced at the pre-game press conference Berahino said "My ambition will be to play in the Champions League and be involved in England seniors and go and play in big trournaments like the World Cup and the Euros". Not an altogether unreasonable ambition for the top English goal scorer in the Premier League, but obviously sparked yet another flurry of transfer speculation and a few brickbats from the West Brom twitteratti. Aside from obviously raising his profile a couple of notches the call up changes nothing with regard Saido's future as a Baggie. His contract position is such that there is no pressing need to sell him regardless of who comes calling in January. Everything else hinges on two things his continued form and secondly if he signs an extended deal with Albion. If his form dips interest will quickly dry up but assuming it does not and without a new deal there is very little hope that we will be retain him beyond next summer or at the very latest the following year. I think we should enjoy his talent for the time being and trust the club to extract maximum value from the deal when the day comes for him to move on to the bigger stage.